I have a fondness for large china dolls and this one is just gorgeous. She is a large, Civil War era china doll and her hair style is referred to as a “flat top.” She has an old body. The term “original” rarely applied to early dolls with cloth bodies. Many times these dolls were sold without bodies and the mother made the body. Other times, the body deteriorated and a new body was made. But this body is old. Her body was sewed with a flat behind so she could sit upright in a chair or on a shelf. It appears in an attempt to conserve the body from further deterioration, a stocking cover was made for the older body. She is stuffed with sawdust, which was common for dolls of this era. Sawdust could be backed tightly and gave a nice firm feel to the body. However, the sawdust often made the doll bodies deteriorate since the wood was sometimes treated with chemicals. This old body is showing signs of deterioration due to the sawdust filling. Her clothing is as lovely as she is. She has a beautiful hand stitched outfit with a delicately embroidered chemise and a bright red pinafore. Her little black tie at the neck gives the overall outfit a very period look. The painting on her is exquisite. She has bright red cheeks, bright red eye lid line and red dots in the inside corner of each eye. 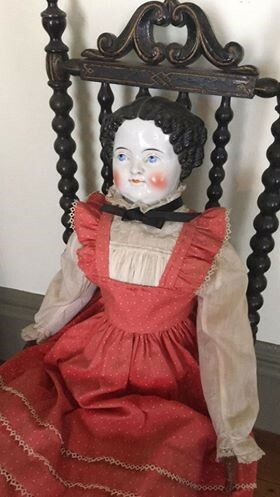 It is interesting to note that the painter used only three colors: black, blue and red to create the beautiful features on this doll. The dolls were painted only once, glaze including. The white porcelain was glazed and then the paint applied over the glaze. This is why with play the paint wears off on china dolls. Despite her body, she is in good condition for her age. You can see her and other dolls at the Drake House Museum. It is open Sundays from 2-4. Email me directly with any questions you have about the dolls.